This is one of the gorgeous projects we have for you to make at Open Door Coffee Shop on Friday, 10th May at 10am and The Baum on Tuesday, 14th May at 6pm. 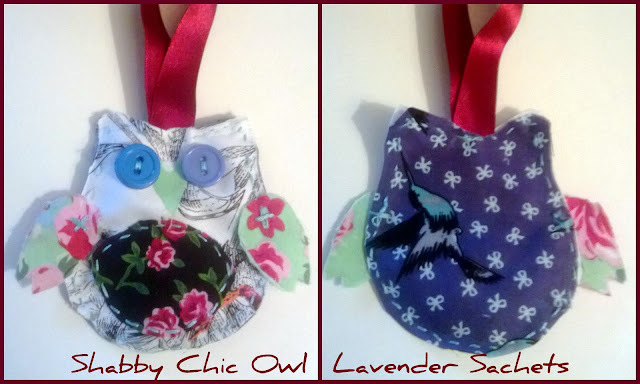 This cute Shabby Chic Owl contains a spoonful of Lavender to freshen your linens and keeps those moths at bay. Lovingly stitched from scraps of Vintage style fabric (thank you Lindsay at Violet Flamingo). What a lovely sweet smelling project to accompany our cake and cheesy chips!!! It costs just £5 to attend the Creative Workshops which covers all craft materials and expert tuition. Refreshments are available to purchase from either venue. We recommend the cheesy chips at The Baum and the lovely Carol's homemade cake at the Coffee Shop.